Hydrothermally grown synthetic emeralds crystallize slowly out of a solution (a mix of water and dissolved elements) that has been exposed to heat and pressure similar to the conditions on Earth under which the natural gem mineral grows. Synthetic gems have the same chemical, optical, and physical properties of their natural counterparts, but are a more cost-effective alternative to a natural gem. 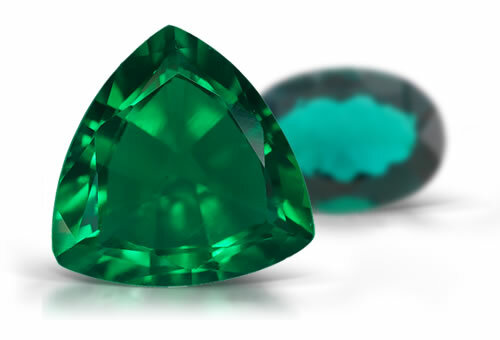 Hydrothemal synthetic emerald often contains fingerprints, liquid and 2-phase inclusions, nailhead spicules, seed plates, opaque black hexagonal plates, synthetic phenakite or chrysoberyl crystals, gold inclusions, numerous red brown and fine white particles. The white material can also have the appearance of "comet tails" or stringers. In the Chinese and some Russian material wavy or chevron like growth can be seen.